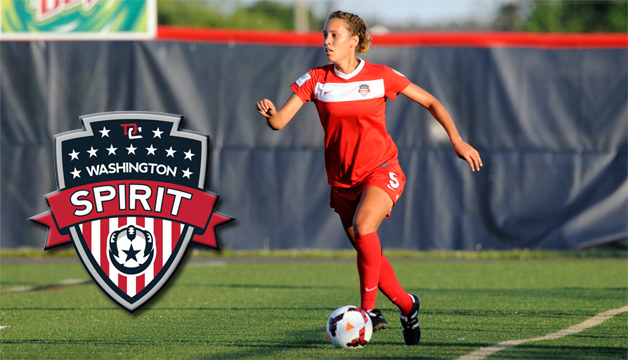 Still reeling from a 0-0 draw the night before against Long Island, the Washington Spirit Reserves rebounded to earn a tight 2-0 win over the North Jersey Valkyries Sunday afternoon in Wayne, New Jersey. After suffering through a 150-minute scoring drought over most of the weekend, the Spirit Reserves finally sorted out their offensive difficulties to score two second half goals and secure an additional three points in the standings. As they had the previous day, the Washington defense held possession for the majority of the match by maintaining control in the back and disrupting any North Jersey attacking threat. As the day wore on and the possibility of another scoreless result loomed, the Spirit Reserves felt the strong urgency to push forward offensively to break the deadlock. The Washington surge finally paid dividends when a scramble in the Valkyries box led to a hand ball call in front of the North Jersey goal. Columbian native Lina Granados, still giddy from her national team’s World Cup group match victory the previous day, powered her penalty kick shot into the right side of the net for the 1-0 advantage in the 60th minute. The Spirit Reserves knocked home an insurance tally in the waning moments of the match, their only goal scored during the run-of-play over the weekend. Midfielder Katie Yensen gained a step on the North Jersey defense and fired a low cross from the right corner. Running at full tilt towards the near post, defender Melissa Downey one-timed her shot past both her defender and the Valkyries keeper to double the Washington advantage in the 84th minute. The victory keeps Washington atop the Northeastern Conference with a marginal lead courtesy of a 5-0-1 record. The New Jersey Wildcats remain in second place, two games back from the Spirit Reserves in the standings. The Spirit Reserves return home this Wednesday to face local rival Braddock Road Stars Elite. The match is scheduled for June 18th at 7:30PM at Howison Soccer Complex in Woodbridge, Virginia.